I have been working on the Pyrenean Brown Bears for some years now. They are only around 40 individuals in a 415 km long mountain range and they are extremely difficult to find. It’s an endurance photographic work. 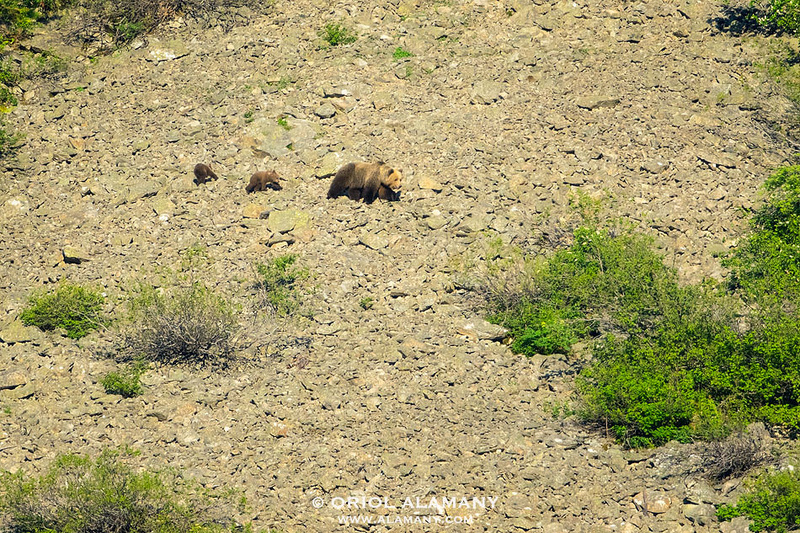 One month ago, last June, and thanks to the biologist Marc Alonso, I saw my first pyrenean Brown Bear mother with cubs in the wild! It was a hard and difficult task, four days of waiting in the mountains. But I was happy to witness this event, with respect and from a distance. For that reason I worked with my Canon EF 500mm f:4L IS II and a 2x teleconverter adapted to a Micro 4/3 camera body (Crop factor 2x). The focal lenght equivalent was 2000 mm!. This shot was done early morning in my last day there, when the usually shy female crossed an open space with her two cubs.